Elmer Baker Heath and his twin brother Delmar Ray were born in 1918 and grew up during World War 1, nestled in the foothills of south west Virginia, in a small community near Chilhowie. They were the 1st born children of Scott and Nora Heath and were part of a close knit farming family, surrounded by the beauty of nature and the simple life of that day. They survived the great depression by raising their own food and were somewhat protected from the evils of the world by the serenity of their family and friends. The family grew to include 4 other brothers and 3 sisters. At this time in history, our country was embarking on the greatest war of all time, but they had no idea of the impact this would have on their family. In 1939, Elmer B. Heath took Virginia Jones to be his wife and in 1941, their union was blessed with their 1st child, a daughter, Nancy. While struggling with the war-ravaged economy, he was making their living by working in the farming community where they lived. He alternately worked in trucking, farming, and whatever was available at the time. 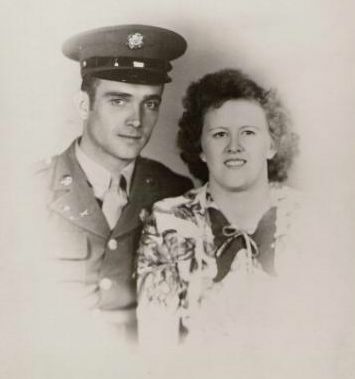 In 1943, their 2nd daughter, Helen, was born. Elmer and his wife, Virginia. All this time, the war was accelerating and his imminent induction into the Army loomed on the horizon. 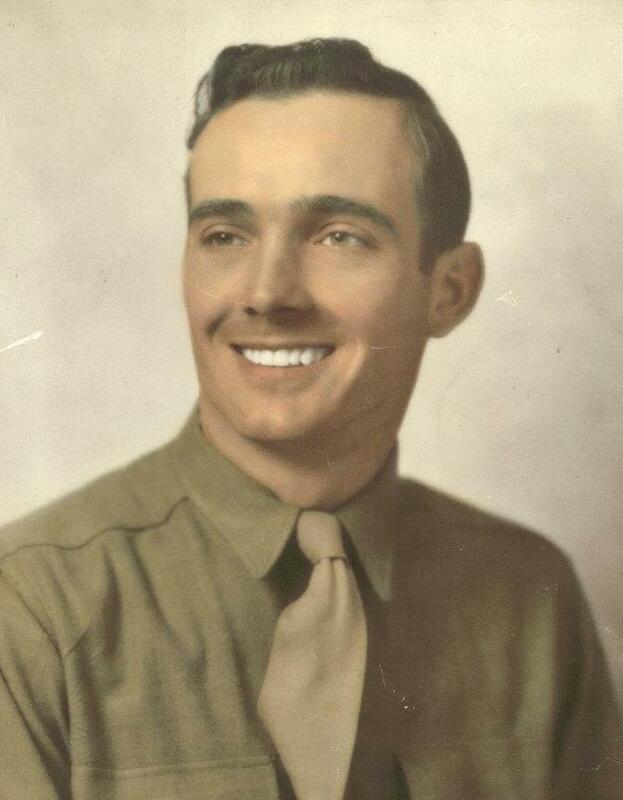 Like the men of his day, he accepted the call in May of 1944 with no complaints, even though his heart remained behind in Virginia with his family. He was inducted at Fort George Meade, Maryland, and went through his Basic Training at Camp Wheeler in Georgia, hoping against hope that the war would end before he had to go across the sea. When he found that was not to be the case, he shipped out in October of 1944. 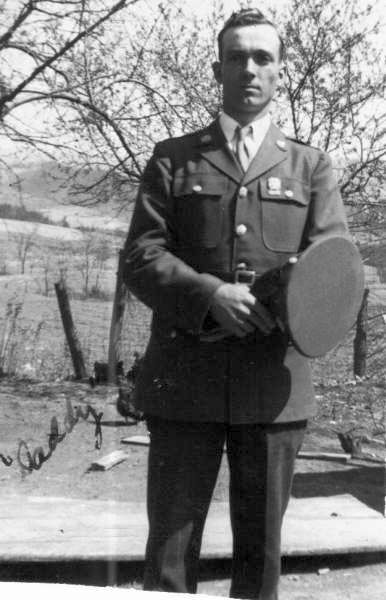 He was assigned to Company A in the 47th Infantry Regiment of the 9th infantry Division. We know that he traveled thru France into Belgium and on to his last battle at Remagen, Germany. His unit earned the nickname of The Raiders, under the direction of Colonel George W. Smythe. Elmer Heath as he left to fight the war. Thru the letters that were saved, we have come to know this man that proved through the test of time to be so strong. In all of his letters home, he was more concerned about his brothers than he was of himself. His 3 brothers were serving in the war at this same time. Even though he hoped against hope that he would be able to see the two who were in Europe, that did not happen.. On March 7, 1945, his unit was ordered to the Ludendorff Bridge over the Rhine, which had been seized intact by elements of the 9th Infantry Division. Early on March 8, the 2nd Battalion, 47th Infantry Regiment arrived and immediately crossed the river. These units passed through Orsberg and attacked toward Bruchhausen where all resistance was overcome. It was during this fierce battle that PFC Heath and many other brave soldiers lost their lives. He was killed in action on March 9th 1945 in Bruchhausen Germany which is a small town just on the other side of the Lundendorf Bridge, near Remagen. This battle was one of the major turning points of the war. History relates that this battle was one of the most important for the Allied forces in accomplishing their mission to defeat the Germans. His wife Virginia was notified of his death on March 21st of 1945, which was 11 days after he fell. At that time Nancy was 3 ½ years and Helen was 17 months old. They were taught by their mother to respect and love the father that they never knew, who was always their “Hero“. Virginia gave them the greatest gift she possibly could by keeping her girls in constant contact with their grandparents and aunts and uncles. Nancy and Helen and their families have experienced the love and companionship of their father thru his family. That is truly a gift that cannot be measured, and will live on thru generations. 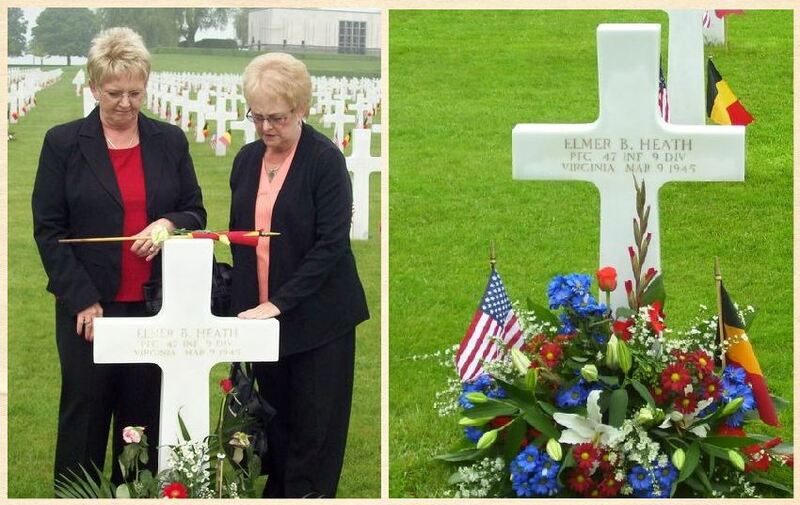 PFC Elmer B. Heath is buried at the US Cemetery in Henri Chapelle, Belgium. His daughters Nancy and Helen are still very involved in doing research about their father, and try to visit his last resting place as often as possible. Daughters Nancy and Helen visit their dad’s grave at the Henri Chapelle Cemetery in Belgium. Private First Class Elmer B. Heath’s actions and ultimate sacrifice four our freedom will never be forgotten.